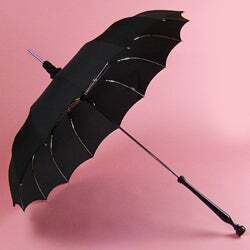 A few years ago, I bought a Bella Umbrella from Diva Dollz in Seattle. It was pricey, yes, but COMPLETELY worth it; not only does the shape hang tough in the worst windy, rainy weather we get here in Vancouver, but it also doubles as a wonderful gothy parasol when I'm out in the sun. I was heartbroken recently when I realised one of the fiberglass ribs had snapped. I'm pretty sure it was through my own carelessness—I think it may have gotten stepped on. So kudos to Bella Umbrella (and the lovely Natalie to whom I chatted with on the phone) in Seattle for making my day today. I found out my that my beloved black pagoda umbrella is under lifetime warranty, so I don't have to worry about trying to replace the broken rib—they're sending me a whole new (and improved—the ribs are now metal instead of fiberglass) replacement—free of charge. This is how you take care of your customers, and make them happy ones.